Constellation, 3111 N. Western Ave.
Join ESS for our summer gala! We're taking over the whole Constellation and Links Hall space for a full evening of performances—this is a line up you do not want to miss. 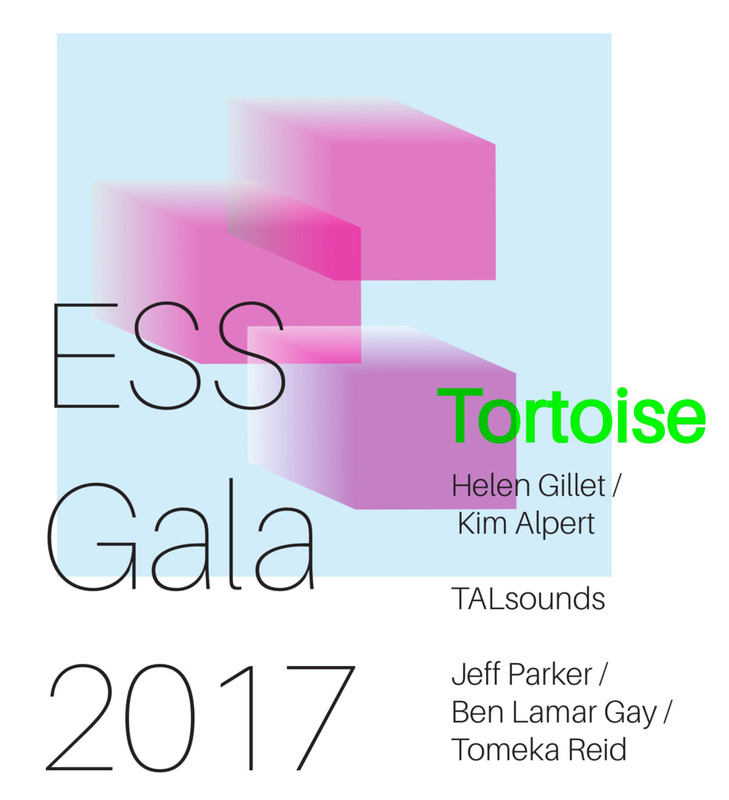 All proceeds go directly back into our programs, supporting the artists we work with and helping ESS make space for creative experimentation. The evening will also feature food by Sauce and Bread Kitchen. Cash bar. VIP ticket holders get front row seating; a signed limited-edition artist t-shirt by Damon Locks; a copy of the new Tortoise record, The Catastrophist and more. Simply put, Tortoise has spent nearly 25 years making music that defies description. While the instrumental quintet—comprised of multi-instrumentalists Dan Bitney, John Herndon, Doug McCombs, John McEntire and Jeff Parker—has nodded to dub, rock, jazz, electronica and minimalism throughout its revered and influential six-album discography, the resulting sounds have always been distinctly, even stubbornly, their own. 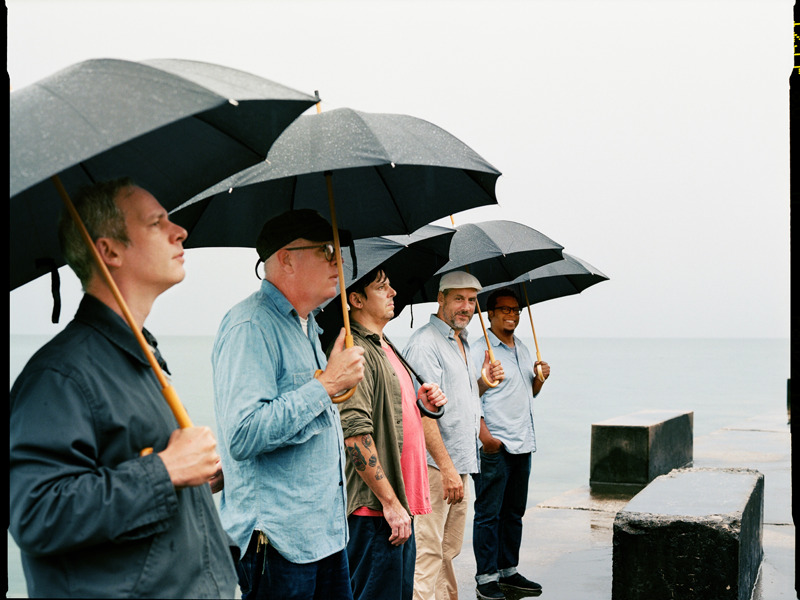 It’s a fact that remains true on their most recent recording “The Catastrophist,” Tortoise’s first studio album in nearly seven years. And it’s an album where moody, synth-swept jams like the opening title track cozy up next to hypnotic, bass-and-beat missives like “Shake Hands With Danger” and a downright strange cover of David Essex’s 1973 radio smash sung by U.S. Maple’s Todd Rittmann. Throughout, the songs transcend expectations as often as they delight the eardrums. As ever, Tortoise has conjured sounds on “The Catastrophist” that aren’t being purveyed anywhere else in music today. There’s a deeply intuitive interplay between the group members that comes only from two decades of experimentation, revision and improvisation. And at a time when our brains are constantly bombarded by myriad distractions, Tortoise's music reminds us that there’s something much greater out there. All we have to do is listen. Jazz-based cellist, singer, composer and improviser HELEN GILLET grew up in Belgium, Singapore, Chicago and Wisconsin. Performing her own eclectic mix of French, Contemporary Jazz, North Indian, Blues and Classical styles, Gillet has forged a path for the cello in the New Orleans music scene since her arrival in 2002, winning Best Female Performer (2014 Gambit Big Easy Awards), Best Mixed Bag (2012 Gambit Big Easy Awards) and Best Contemporary Jazz (2011 Gambit Big Easy Awards). She has performed extensively across the United States and Western Europe with countless musicians including Cassandra Wilson, Kid Koala, Smokey Robinson, Nikki Glaspie (Beyonce, Dumpstafunk, Neville Brothers), John Popper (Blues Traveler), Members of Morphine with Jeremy Lyons, Allison Miller (Ani Difranco), James Singleton, Tastuya Nakatani, Caroline Davis, Skerik, Wardell Querzergue, Arcade Fire, Michael Cerveris, Psychedelic Furs, Quintron, Tom McDermott, Tim Green, Wadada Leo Smith, Doug Garrison (Iguanas, Alex Chilton), Johnny Vidacovich, Clint Maedgen, Michael Zerang, John Boutte, Mars Williams, Mazz Swift, Mat Maneri, Hamid Drake, Myshkin, Nicole Mitchell, Ken Vandermark, Michael Ray (Sun Ra), and many others. KIM ALPERT believes, first and foremost, in human-centric design and integrating technology with strategy in her time-based work. With a background in fine art, music, and carpentry Kim brings an attention to detail and diverse styles to both her video installation and advertising work. Kim’s art primarily focuses on humanism, media and change. Kim holds a degree in Digital Art & Design from Full Sail University and was inducted into their Hall of Fame in 2013. As a curator, Kim has produced events from intimate gallery exhibitions to large festivals. She has displayed her original works at places like SOFA Expo, The Modern Wing at the Art Institute of Chicago and Facets Cinematheque. As a creative professional, she’s worked for top advertising agencies for over a decade. She has developed expertise in building programmatic creative executions merging aesthetics, psychology and technology. This, coupled with holistic analytics, yields better decision-making and provides a unique ability to fine-tune actionable plans that get results. She currently maintains her artistic and collaborative works through Make Amazing Inc.
Kim is an outspoken advocate for social change through technology, meditation and bananas. NATALIE CHAMI adopted the TALsounds moniker in 2009 for her solo explorations in the drone, ambient, and electro-acoustic improv disciplines. 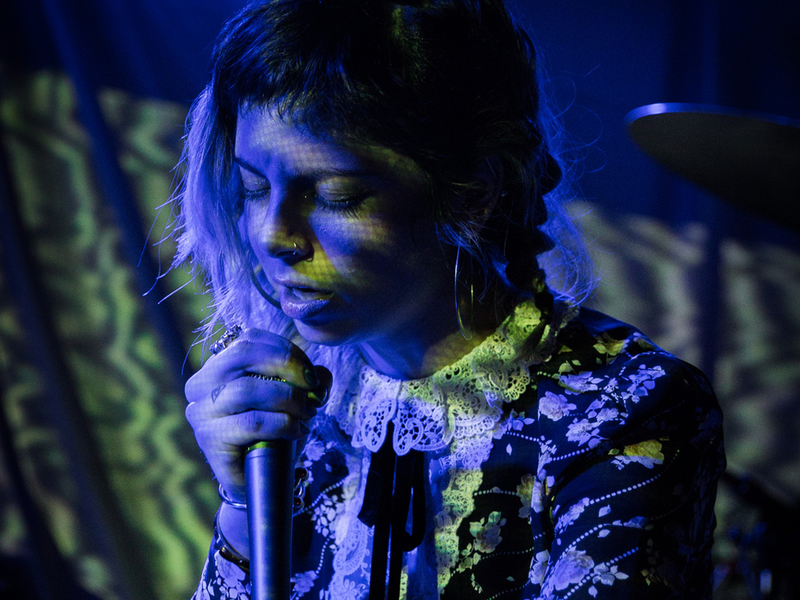 In live performance, Chami's analog synthesizers weave together into drifting loops that evolve in tandem with her vocal leads and choral harmonies. Her meditative sessions stretch into hypnotizing depths of stream-of-consciousness multi-instrumental input, sinking into expanses of infinite sustain and cresting into bursts of noise from an arsenal of oscillators and effects pedals. As a member of free music trio Good Willsmith, she has toured the country and released eight albums since 2012, including the LPs The Honeymoon Workbook (2014) and Things Our Bodies Used To Have (2016) on Mexico City-based label Umor Rex. Chami performs as half of ambient duo l'eternebre, and co-founded the experimental collective/netlabel Screaming Claws. She was born in Ontario and lives in Chicago. Connecticut born and Berklee educated, JEFF PARKER is a guitarist, composer, educator, and “sculptor of sonic textures.” A founding member of the critically acclaimed and innovative groups Isotope 217˚ and Chicago Underground, he is a longtime member of the band Tortoise, the Brian Blade Fellowship, and the Exploding Star Orchestra. He has performed all over North America, Europe, and Asia, been recognized seven times by DownBeat Magazine’s Critic’s Poll, named “Jazz Soloist of the Year” by the Chicago Reader “Reader’s Choice,” and acknowledged as one of contemporary music’s most versatile and innovative electric guitarists. The fruits of this long musical journey can be found on Jeff Parker’s albums Like-Coping, The Relatives, Bright Light In Winter and, most recently, The New Breed. BEN LAMAR GAY is a composer/cornetist/vocalist/producer who moves components of sound, color and space through folkloric filters to produce brilliant electro-acoustic collages. The unification of various styles is always in service of the narrative and never a pretentious display of technique. Gay's true technique is giving life to an idea while transforming the idea behind the term “Americana”. His musical influences derive from his collection of experiences in the Americas (North, Central and South) and the gathered data channeled by technology and its amplifying accessibility. The fact that the world is closer via technology and that everyone has access to the possibility of exploring different ideas, makes his avant-garde version of “Americana” very global. Embracing international vision while remaining true to his roots, Gay’s creative output aligns with the honest notion that he only knows how to be a man from the south side of Chicago. Recently described as a “New Jazz Power Source” by the New York Times, Chicago cellist and composer TOMEKA REID has emerged as one of the most original, versatile, and curious musicians in the Chicago’s bustling jazz and improvised music community over the last decade. Her distinctive melodic sensibility, usually braided to a strong sense of groove, has been featured in many distinguished ensembles over the years. Reid has been a key member of ensembles led by legendary reedists like Anthony Braxton and Roscoe Mitchell, as well as a younger generation of visionaries including flutist Nicole Mitchell, singer Dee Alexander, and drummer Mike Reed. She is also a co-leader of the adventurous string trio called Hear in Now, with violinist Mazz Swift and bassist Silvia Bolognesi. Reid released her debut recording as a bandleader in 2015, with the eponymous recording by the Tomeka Reid Quartet, a lively yet charged debut album that is a vibrant showcase not only for the cellist’s improvisational acumen, but also her knack for dynamic arrangements and her compositional ability. Her work with Nicole Mitchell and various Association for the Advancement of Creative Musicians-related groups have proved influential to the young musician. By focusing on developing her craft primarily as a side person and working in countless improvisational contexts, Reid has achieved a stunning musical maturity. Reid is a 2016 recipient of a 3Arts award in music and received her doctorate in music from the University of Illinois, Urbana-Champaign in 2017.